Many ports and maritime offices want the benefit of a local AIS feed to see shipping activity, ETAs and movements. 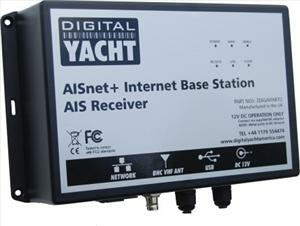 Digital Yacht's AISNet+ AIS base station is a low cost AIS receiver designed for just this application with a network port for connecting to local computer networks or to the internet for relaying of local signals to services like Marine Traffic and other internet based AIS monitoring solutions. It also has a USB connection for a simple plug 'n play connection to a local computer and the package includes viewing software for Windows. The system also integrates well with popular coastal surveillance software such as MaxSea/Time Zero and will overlay AIS information onto charting and radar displays. AISNet+ also has a built in, patented ZeroLoss VHF-AIS antenna splitter allowing an existing VHF antenna that may be installed on the building to be used for the AIS as well as VHF - easing installation without the need to fit a 2nd antenna. Most ports and harbours will already have a VHF radio installation so this greatly simplifies the addition of AIS. The sophisticated receiver will also decode specialist AIS targets such as ATONs and SARTs so can also be used for lone worker safety applications around ports using personal MOB AIS alarms. There is also the option of a version with VPN connectivity for encrypted transmissions for military applications. The new AISNet+ version with the built in splitter costs £500/€610/US$749/AU$949.95.